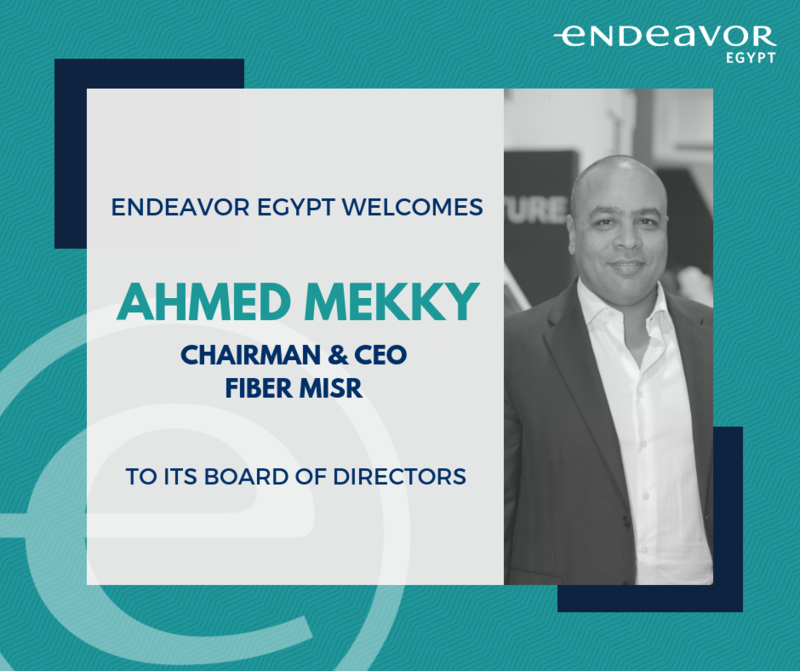 CAIRO, EGYPT- March 31, 2019 - Endeavor Egypt welcomes renowned telecommunications and technology entrepreneur and expert Ahmed Mekky to its Board of Directors. Mekky is the Chairman and CEO of Fiber Misr, a telecommunications and IT holding company and systems integrator currently focusing on the Egyptian market with plans to spread regionally, utilizing the most advanced technology available and Implementing the highest quality standards driven by "A" class calibers, associates and partners. He is also the Co-Founder of Gulf Bridge International (GBI), the region’s first-ever privately owned telecommunications service provider that operates its own neutral submarine cable connecting the MENA region to Europe, Africa and Asia. Under the Chairmanship of Ayman Ismail, Chairman of DMG, Mekky joins Amr Shady, CEO of Aingel Corp, Mohamed Azab, CEO of Seha Healthcare, Amir Barsoum, CEO of Vezeeta, and Tarek Fahim, Managing Partner at Endure Capital in playing an instrumental role in advancing Endeavor’s mission and promoting sustainable economic growth in Egypt through supporting high-impact entrepreneurship. As an organization that is of, by and for entrepreneurs, Endeavor Board Members are Egyptian entrepreneurs and entrepreneurship champions who share a common commitment to help create the next generation of entrepreneurial success stories and, through their strategic guidance and engagement, build a thriving ecosystem that will continue to generate innovation, wealth, and employment. Today, Endeavor Egypt supports 49 high-impact entrepreneurs leading 31 companies that have collectively generated over EGP 3.9 billion in revenues in 2017 and created 8,800+ jobs since selection. Mekky’s tireless contributions to the development of the telecommunications and technology industry in the region has aided in his recognition as one of the most influential leaders in the industry. In 2012, Mekky was the first and only Middle Eastern CEO in the Pacific Telecommunications Council Board of Governors, serving for a 3-year term, and was appointed to sit on the board of ITIDA and the Italian Egyptian Council to facilitate economic relations between Italy and Egypt. He was also appointed as a member of the Industry Committee of Telecommunications Regulatory Authority of Egypt (NTRA) in 2013 and the Egyptian Kuwaiti Cooperation Council in 2015. In addition to having led GBI to winning a number of prestigious awards, including Best Telecoms Technology Investment and Best Niche/New Player in 2012 by CommsMea and Capacity Europe respectively, Mekky was named in the Global Telecoms Business (GTB) Power 100 list and the top 100 most influential leaders in the communications sector, and awarded CEO of The Year 2014 in the telecommunication category of CEO Middle East Awards.